Mostly men have passion of riding motorbikes, and all of them always try to have the biker look. 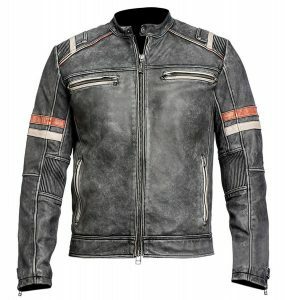 Men’s Vintage Cafe Racer Motorcycle Retro Distressed Leather Jacket is an important gear of dressing up like a biker. This jacket is made of real leather and it’s color is distressed black which making it vintage style biker costume. It has also detailing on shoulders and sleeves. It has two front-side pockets with zipper. It has small collar with tab button. Polyester lining inside that’s making it more comfortable to wear it for long time.